In North America, the Carboniferous is divided into two subsystems: the Mississippian (early Carboniferous from 354-323 mya) and the Pennsylvanian (late Carboniferous from 323-290 mya). This nomenclature is different in Europe and China, where different names and divisions have been made to the Carboniferous. Upper and Lower subdivisions were used to separate the coal measures dating from the late Carboniferous from the limestone strata of the early Carboniferous. In Europe, the Lower Carboniferous is called the Dinantian and the Upper and Middle Carboniferous are together called the Silesian. The boundary between the Upper and Lower subdivisions in Europe is known to be below the boundary between the Pennsylvanian and the Mississippian subsystems in North America. Within these subsystems there are further subdivisions based on the evolutionary successions of fossil groups. The series used in Eastern Europe, and which the United States Geological Survey follows, are (from early to late) Tournaisian, Visean, Serpukhovian, Bashkirian, Moscovian, Kasimovian, and Gzelian. An alternative series occasionally used in the United States are the Kinderhookian, Osagean, Meramecian, Chesterian, Morrowan, Atokan, Desmoinesian, Missourian, and the Virgilian. The chart at left shows the major subdivisions of the Carboniferous Period. The Lower Carboniferous of Europe corresponds roughly to the Mississippian of North America, and the Middle and Upper Carboniferous are roughly equivalent to the Pennsylvanian. This chart is mapped, to allow you to travel back to the Devonian or forward to the Permian. The Carboniferous Period is part of the Paleozoic Era. The appearance or disappearance of fauna usually marks the boundaries between time periods. The Carboniferous is separated from the earlier Devonian by the appearance of the conodont Siphonodella sulcata or Siphondella duplicata. Conodonts are a series of fossils that resemble the teeth or jaws of primitive eel- or hagfish-like fish. The Carboniferous-Permian boundary is distinguished by the appearance of the fusulinid foram Sphaeroschwagerina fusiformis in Europe and Pseudoschwagerina beedei in North America. Fusulinids are giants among protists and could reach a centimeter in length. They were abundant enough to form sizable deposits of rock, known as "rice rock" because of the resemblance between fusulinids and rice grains. The Mississippian is differentiated from the Pennsylvanian by the appearance of the conodont Declinognathodus noduliferus, the ammonoid genus Homoceras, and the foraminifers Millerella pressa and Millerella marblensis. The markers of these boundaries apply only to marine deposits. The distinction between the Pennsylvanian and Mississippian subsystems may also be illustrated by a break in the flora due to transistional changes from a terrestrial environment to a marine one and as a result of a change in the climate. The stratigraphy of the Lower Carboniferous is distinguished by the shallow-water limestones. These limestones are composed of parts of organisms, mostly the remains of crinoids. These thrived in the shallow seas of the Lower Carboniferous. Other limestones include lime mudstones and oolithic limestones. Lime mudstones are composed of the carbonate mud produced by green algae. Oolithic limestones are composed of calcium carbonate in concentric spheres that were produced by high wave energy. Sandstones (sedimentary rock composed of quartz sand and cemented by silica or calcium carbonate) and siltstones (rock composed of hardened silt) are also found in the Lower Carboniferous strata, though not in as great abundance than the limestones. 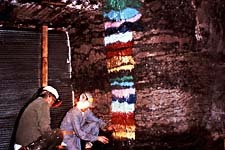 Stratigraphic sections : On the left, scientists in a coal mine have color coded the successive layers of coal ball formation. Each layer represents an individual flood event in the coal swamp. 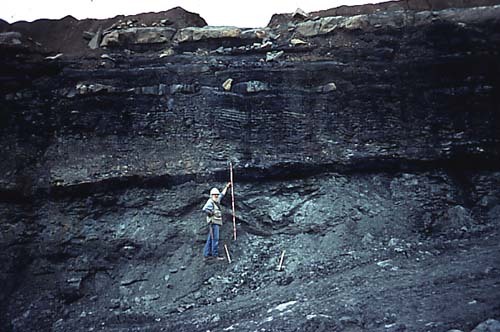 On the right, a scientist observes the evidence of glacial and interglacial strata in Kansas. Glacial periods result in lowered ocean levels, while interglacial periods result in a rise in ocean levels, covering the continental shelf with shallow seas. Coal beds, which can be up to eleven to twelve meters thick, characterize the Upper Carboniferous. Deposits reflect the transgression and regression of the seas over the continents. The layers consist of sandstone, shale, "freshwater" limestone, underclay, and a coal bed. The forests of seedless vascular plants that existed in the tropical swamp forests of Europe and North America provided the organic material that became coal. Dead plants did not completely decay and was turned to peat in these swamp forests. When the sea covered these swamps, marine sediments covered the peat. Eventually, heat and pressure transformed these organic remains into coal. Coal balls found in sites contain these plant remains. The type localities for the Mississippian Period are Kinderhook, Illinois; the Meramec River, southeastern Michigan; and the Chester district, southwestern Illinois. All three type localities are in the upper Mississippi Valley. Other type localities for the different series within the Mississippian Period occur throughout Europe and North America, some of which are the Avon Gorge section in Bristol, England and the Pocono Group in the Appalachian region of North America. The type locality for the Pennsylvanian Period occurs in central West Virginia in the United States. Others occur in the Jackfork and Johns Valley shales of Oklahoma and Arkansas and the Supai Group in the Grand Canyon. In Europe the type localities for the Upper Carboniferous include the Millstone Grit and the Coal Measures in England. Index fossils are the remians of plants and animals that characterize a well-defined time span and occur over a wide range of geography. Fossils of marine life characterize the Mississippian Period, as shallow epicontinental seas covered the United States at that time. These fossils include solitary corals and Syringopora, tubular colonial corals. Other fossil colonial corals include Stelechophyllum and Siphonodendron. Because conodont fossils are distributed all over the world, they are utilized internationally to date Mississippian rocks. Index fossils used for the Pennsylvanian Period are fusulinid foraminifers and the pollen and spores from the coal forests prevalent during that time. The Mississippian-Pennsylvanian boundary is marked by the appearance of the fusulinid Pseudostaffella antiqua. Other fossils used to identify the early Pennsylvanian Period are the three ammonoid cephalopod genera: Gastrioceras, Daiboloceras, and Paralegoceras, found in marine deposits. Beerbower, James R. 1968.Search for the Past: An Introduction to Paleontology, 2nd Edition.Prentice-Hall: Englewood Cliffs, NJ. Chengyuan, Wang, 1987. "Carboniferous boundaries in China: contribution to the 11th International Congress of Carboniferous Stratigraphy and Geology, 1987, Beijing, China." Science Press:Beijing, China. Linxin, Zhang, 1987. "Carboniferous Stratigraphy in China." Science Press: Beijing, China. McGraw-Hill Encyclopedia of Science and Technology, 8th Edition. 1997, McGraw-Hill:San Francisco. The New Encyclopedia Britannica. 1994, Macropedia Indepth Knowledge, Encyclopedia Britannica, Inc.: Chicago.